Good morning, and a Happy Saturday all around! Spring is springing here in Kansas – the sun is shining, the birds are singing, and out amongst the dead grassy remnants of winter, my crocuses are blooming. Now all we need is a little rain! It’s been a while since I’ve written up any news snips. These are little collections of embroidery-related bits I’ve come across online that are either informative, inspirational, or instructive. So I thought today would be a good day to compile a list that you can enjoy meandering through over the weekend. Go pour yourself a cup of something and join me! Let’s explore! Hedgehog Handworks is having their yearly 15% off sale until Tuesday, March 15. If you haven’t gotten in on it yet, there’s still time. Hedgehog carries a lot of fine needlework supplies, most of which you don’t normally find on sale, so it’s a great opportunity to cross some stitching items off your Wish List. Stuff from Hedgehog that’s perpetually on my wish list: good embroidery linen (especially Alba Maxima, which I use as a general linen for just about any kind of surface embroidery); DMC coton a broder and floche; Au Ver a Soie silk threads; Hardwicke Manor hoops; goldwork threads of every ilk and variety. 2017 update: Joady, the owner of Hedgehog Handworks, retired in 2017, and so, regrettably, the shop is no longer with us! What is it about Wish Lists? Mine is in Perpetual Growth Mode. Trish Burr has been adding to her “Shades of Whitework” collection, and if you love whitework techniques, you’ll love her interpretation of fun designs into whitework techniques tinged with shades of gray and other subtle colors. One of her latest is titled “Gatsby,” and you can see it and read about it here on her blog. So ’20’s chic! You can find several more of her “Shades of Whitework” projects available in her Etsy shop as digital downloads. There’s a funky cat in there, some plump birds, baskets, flowers, and so forth. They’re a fun digression from regular white whitework! Album d’Alphabets et de Monogrammes #2 – you can download individual pages from that overview page there, by clicking on the individual page and right clicking and saving the enlarged image. Anchor – Lots of neat patterns in here worth downloading, from floral motifs to geometric, borders, uncommon motifs, just some really fun stuff! Arte e Diletto (PDF – I find the PDFs from APL open more consistently using Chrome as a browser, so if the PDF doesn’t open for you, you might have to switch browsers.) This is a collection of Art Deco cross stitch charts. It includes alphabets and decorative elements. La Brodeuse Francaise Illustrée (PDF) – A collection of embroidery designs, including flowers, children’s themes, borders and other drawings. Dessins de Vitrerie – Overview Page – these are designs for stained glass, but their geometric layout would be perfectly adaptable to stitchery. Needlepoint comes to mind. Blackwork comes to mind. Or just surface embroidery! There’s just some whitework embroidery that is worth seeing, and this piece, Dentelle de Rose, on the blog Aux Points de Touraine really should be seen! It’s glorious! Traditional, fine whitework at its best! I like covered buttons. I love embroidered covered buttons! Pat at Birds Nest on the Ground shares some great photos of her collection of embroidered covered buttons, here. Click on the photos for larger versions! If you like making embroidered buttons, these will supply you with some great inspiration! I’m really enjoying Tracy Franklin’s recent project development that she’s demonstrating on her blog. Her latest is experimenting with trellis work. I really like what she’s doing! Jeanny in the Netherlands is showing various Schwalm blocks on her blog – the latest, Block 36. Check out the filling in the center of the ring! I love it! You can browse through her blog to view other blocks, too. They’re gorgeous! If you want to explore some more whitework – this time, Lefkara – visit Fils et Aiguilles and this article on Lefkara lace. Lovely piece! Did you sign up for the Frostings Club on Thistle Threads? I did. Of course I did. I can’t help the thread addiction. And sometimes, I just have to give into it. Besides, it was my Christmas present. To me. From me. The Frostings Club is a thread shipment club, with specially curated, specialty threads, many of which are in a specially limited quantity. Those that are limited in quantity are essentially short runs of reproductions of threads that are no longer made. They’re made from silk or metal. And they are beautiful! For those who have a penchant for historical embroidery – especially of the 17th Century Variety – the threads would be especially desirable. For me, I like them as threads that can be used just as well in contemporary embroidery. I also like them for study purposes. They help me understand threads better. In any case, over on Thistle Threads, Tricia posted a new Frostings Project. This is a little project that incorporates some of the threads from the Frostings Club shipments. Even if you aren’t receiving the shipments, you can still take a look at the project and download the PDFs. The first Frostings shipment came out in December – you can see it here on Thistle Threads – and the second one should be coming out some time soon. Can’t wait to see what’s in it! Over on Two Nerdy History Girls, they’ve posted the V&A video from The Fabric of India exhibition and started up a chat about tambour work and its history. If you have something to add to the chat, do! Kelly Cline is doing it again over on her quilting blog – gloriously transforming an antique linen into a quilted masterpiece. I love this one! It’s from New Zealand, but it cries “Kansas” to me. I really think this is a great way to repurpose vintage or antique embroidered linens that would never see the light of day again. She does a lovely job with them! Janet Brandt’s stitching is so happy! It’s colorful. It’s folky. It’s fun! I enjoy exploring her blog. If you’re not familiar with her work, check it out! 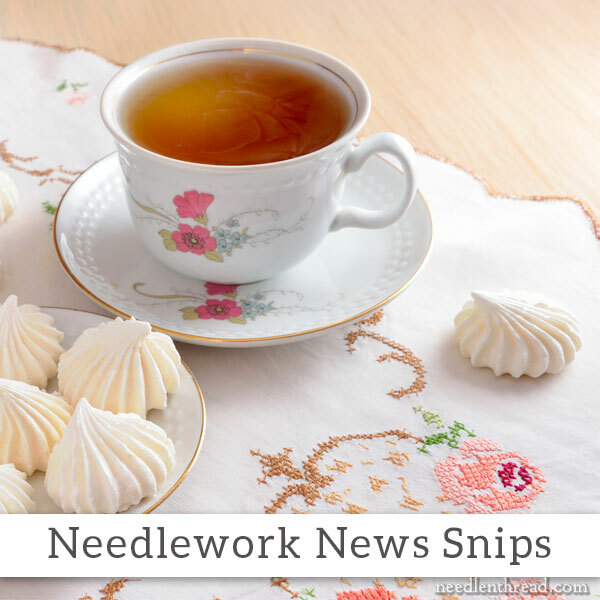 I hope you enjoy exploring these offerings over the weekend and that you have a chance to spend some quality time with your needle and thread over the next few days, too! Thank you, Mary! I so enjoyed this article! Everything is absolutely lovely! I think I found a new addiction – embroidered coverred buttons! Really enjoy this site. As a newbie to embroidery, sometimes my head just about explodes with all the cool stuff here! …hmmm – not sure what happened – that should read ‘off to peruse’…oh well – Thanks! Mary, you are a wicked lady. Here I am, supposed to be proofreading a maths book, and instead I spend my time following all those wonderful links and downloading heaps of stuff from Antique Pattern Library! Dear Mary, Thank you very much for finding all these beautiful websites to browse. I especially loved the Dentelle de Rose. Exquisite. The whitework stump work butterfly on the blog is so dainty it looks as though it’s just alighted on the linen. I can understand how you are looking to receive rain. Here, down under, it is 30-31 degrees C (around 100 F). Same temp for the past two weeks with another week of the same temps stretching ahead with a promise of a little rain perhaps on Thursday. Not at all kind to the garden. Hope you are OK.
Love these snips! Thank you, Mary. Hi, Louisa – yes, definitely, the alphabet can be worked on the Alba Maxima. It really is an all-around, general purpose, great for any surface embroidery fabric, so you probably will use up all you purchase. If you can swing it, go for a full yard. I’ve never been sorry when I’ve bought the full yard. I use the stuff all the time! What fun these were Mary. Thank you so much for sharing them. Like you, my wish list seems to grow longer by the day (particularly when a certain…ahem…person continues to post such great book reviews!! ).